Has the easy money in the Trump bump rally already been made? The stock market has cooled off a bit lately following its euphoric post-election run from November through the end of February. Yes, the Dow, S&P 500 and Nasdaq are all still at or near record highs. But it's worth noting that CNNMoney's Fear & Greed Index, a measure of seven different gauges of market sentiment, is now in Neutral mode. It had been showing signs of Greed -- and even Extreme Greed -- earlier this year. One important indicator in the index, safe haven demand, is flashing Fear levels. Essentially, more investors are starting to flock to bonds over stocks. Bonds are perceived to be less risky, so this could be a sign that the market is growing a little more worried. Two other measures in the index, that look at options trading and market volume, have even dipped into Extreme Fear territory. That could be a worrisome sign. Experts think that for the market to continue rising, Trump needs to prove that his economic policies can kick GDP growth into a higher gear as promised. And there are some doubts. 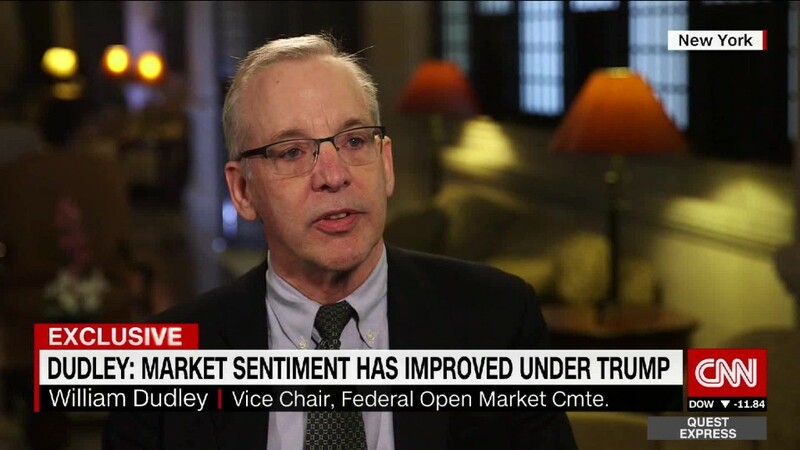 Jeffrey Cleveland, chief economist at Payden & Rygel, said investors may be just a little too bullish on Trump. He's not suggesting that the markets are going to crash or that the economy is going to suddenly slow. But he does think it will be difficult for the president to fulfill his promise of getting the economy growing at 4% annual rate anytime soon. The main reasons? There is just simply so much to do, and it's not yet clear that Trump will be able to quickly reach a consensus with even Congressional leaders in his own party -- let alone Democrats. Tax reform. Unwinding Obamacare. Tweaking Dodd-Frank. Getting an infrastructure bill that could cost $1 trillion or more. All of this will require a lot of compromises, patience and time. "The post-Trump optimism may not translate into real growth that quickly," Cleveland said. "I'm not bearish, but I can't make the 4% GDP math work. Wall Street could be disappointed." Frances Hudson, global thematic strategist at Standard Life Investments, is also a little wary of how bullish the market has become. She argues that investors may be underestimating how tough it will be for Trump to convince hardline, deficit-hating fiscal conservative Republicans to buy into his plans for stimulus. "There could be opposition to stimulus from some in the GOP. The Trump administration is more fiscally liberal than a lot of Republicans in Congress," she said. Of course, if Trump is able to get many, if not all, of his economic proposals approved in a somewhat speedy fashion, then stocks could wind up going off to the races again. Ed Campbell, a managing director and portfolio manager with Prudential subsidiary QMA, noted that earnings for the fourth quarter were pretty solid. He added that Corporate America's profits should continue to improve thanks to some of Trump's plans and the boost to consumer and corporate sentiment that has occurred since the election. But he concedes that the market may be just a little too giddy and that there is still "risk and uncertainty in the U.S. political environment." The good news is that you'd be hard-pressed to find a strategist or economist predicting outright doom and gloom. The so-called animal spirits that have been unleashed since Trump's win do seem to be real -- and maybe even spectacular for any Seinfeld fans out there. The problem is that nobody seems to be worried about anything. And that's often a recipe for a letdown. "The economic expansion is still intact. It may last another 2 to 3 years if we get capital investment and productivity improvement," said Atul Lele, chief investment officer of Deltec International Group. "But the rate of growth and momentum may slow."